Olynthus (hover over map to enlarge) is an ancient city located in Macedonia, an area of northern Greece, about 240 km (150 miles), as the crow flies, north of Athens. The city is on a fingered peninsula that extends into the north Aegean Sea. Olynthus is situated on two flat-topped hills, next to the Sandanus River, which empties into the sea 2.5 km (about 1.5 miles) to the south. The surrounding land is gently rolling, but marshland extends to the south, and large hills rise to the north. The region is well-wooded in the hills and has plenty of pasture land and fertile soil for growing crops. Other ancient towns were within a few kilometers. Olynthus was not a large polis and probably controlled little more than 50 square kilometers of surrounding territory. The data here have been extracted from an early award-winning educational package developed by Learning Sites. We are working to upgrade that, now 17-year old, module to conform to 21st-century standards. A small town had existed on the South Hill since the 7th century BCE. As events were heating up to the Peloponnesian War (431-404 BCE) in southern Greece, Olynthus and a number of other towns in Macedonia were controlled by the Chalcidian people. The Chalcidians were allied with enemies of Athens, the most powerful of the Greek city-states. In 432 BCE, the Macedonian king Perdiccas, also an enemy of Athens, persuaded the Chalcidians to form a league and strengthen their position by moving together into a single town. At this time, or shortly thereafter, the new portion of Olynthus was planned and built on the North Hill to accommodate this influx of peoples. The new portion, which nearly doubled the city's size, was laid out in the checkerboard form that is called the Hippodamian plan. It thus is an early example of the orderly town planning that would become more common in Hellenistic and Roman times. Eventually, 80 years later, the Chalcidians made peace with Athens. However, Philip was now king of Macedon and was still at war with Athens. The Chalcidian turnabout angered him, but an even greater affront was committed three years later when Olynthus sheltered Philip's half-brothers who wanted to take the Macedonian throne from him. Philip demanded the surrender of his brothers, and when he was refused he marched on the Chalcidians. Olynthus appealed for help to Athens, which sent 2000 men in ships. But they were too late. In August of 348 BCE Philip attacked the Olynthians in their city. The town, looted and damaged, was largely abandoned to the natural forces that eventually buried it. 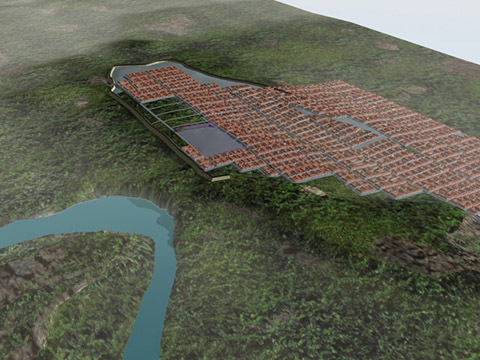 The newly expanded city probably had a population of at least 10,000 and was less than a century old when it was destroyed. This short history makes the site of great use to archaeologists, as it does not have the alterations, additions, and rebuilding that are typical of sites inhabited for centuries. David M. Robinson, Johns Hopkins University, visited the site was in 1902, but it was not until 1928 that, with students and 200 hired workmen, Robinson and his team set out to test his hypothesis that the buried city of Olynthus (widely mentioned in ancient sources) was located on those two hills near the Sandanus River. By this time there was a sense of immediacy in his task, because the area was being disturbed by plowing. Excavations continued in 1931, 1934, and 1938. In a tremendous effort, about 4 hectares (nearly 10 acres) of the city was excavated. The uncovered areas included public buildings and over 100 houses, still the most completely documented residential quarter of any ancient Greek settlement. The results were published in 14 volumes between 1929 and 1952 giving us a unique glimpse into ancient Greek life. The House of Many Colors was excavated by American archaeologists David M. Robinson and Lloyd Daly in 1938, during the last season of fieldwork by the Johns Hopkins University expedition at the town of Olynthus. Our reconstruction is based on the original site report published in 1946, and several later studies of the site (see the Bibliography below). 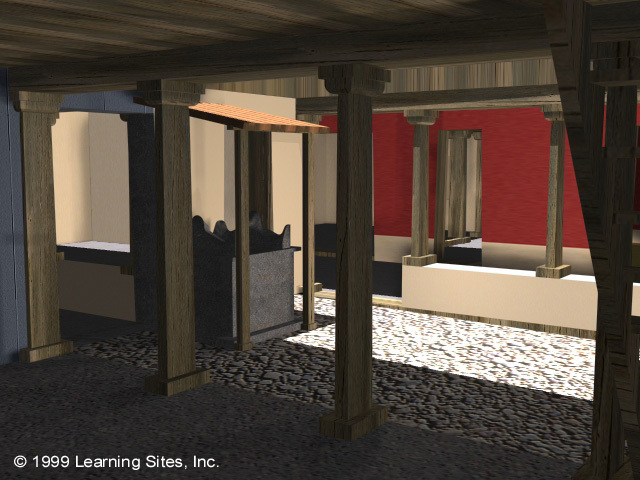 Our early work on Olynthus focused on the so-called House of Many Colors (in conjunction with research by Nicholas Cahill). The new, planned portion of Olynthus was laid out in the latter part of the 5th century BCE on what is known as the North Hill. At about the same time, some larger houses (including the House of Many Colors), called by the excavators "villas," were built to the east, on the eastern side of the East Spur Hill, where the land slopes down to the plain beyond. The House of Many Colors (hover over the plan to enlarge) is one of these villas. 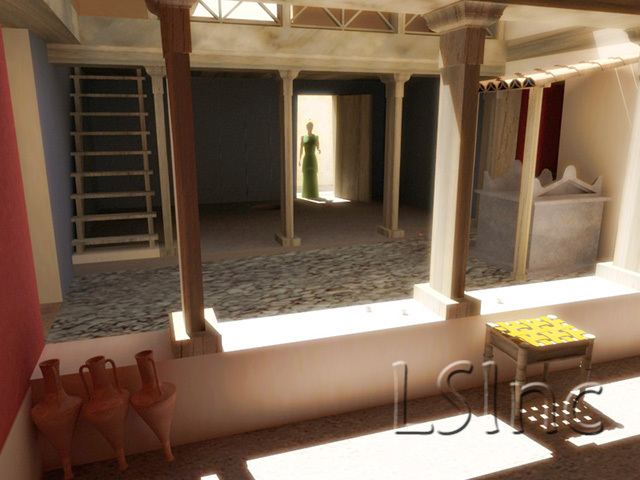 The house, and the house next door, are the only houses of the block that were excavated. The House of Many Colors measures 17 x 17m (about 18.5 yards square). It abuts an unexcavated house on one side, has streets on two sides, and an alley on the fourth. The house orginally contained a second story, little of which has survived. 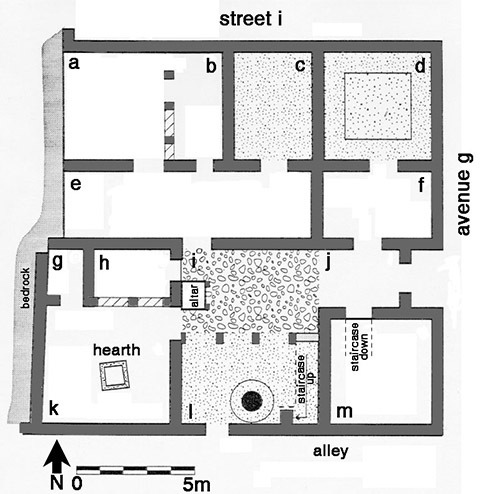 The area marked (e) is a roofed corridor, called in Greek a pastas, adjoining the unroofed cobblestone courtyard (i). 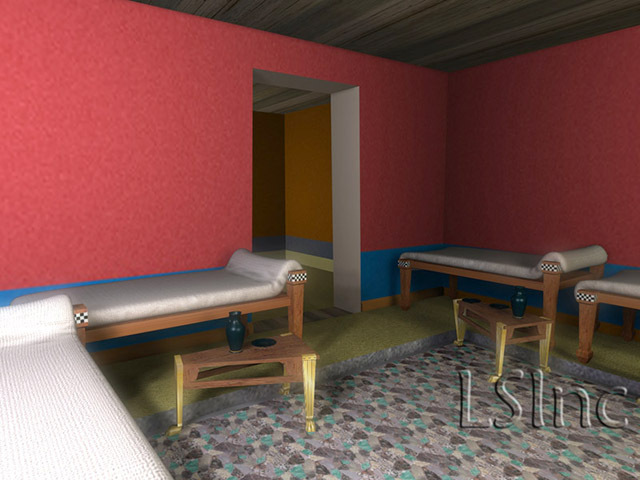 A row of four rooms lies to the north of the corridor. The courtyard is surrounded by several more rooms. The andron or men's gathering room (hover over to enlarge). View across the courtyard from 'e' toward the stairs to the second floor (hover over to enlarge). View across the courtyard from 'i' toward the altar (hover over to enlarge). American Journal of Philology 69:396-407. 1991 Olynthus: Social and Spatial Planning in a Greek City. PhD diss. : Univ. of California, Berkeley. , pp. 365-73 in George Mylonas, ed. Studies Presented to D. M. Robinson. St. Louis MO: Washington University Press. Robinson, David Moore, et al. 1930-52 Excavations at Olynthus, Parts 2-14. Baltimore: Johns Hopkins Press. American Journal of Archaeology 33:53- 76. © 2016-2019 Learning Sites, Inc.